Ban James Franco from Daytime! Publicity whores! Marlena hates them! I’m so sorry that my otherwise carefree, wonderful summer was interrupted by my rants to friends visiting our summer cabin about how James Franco has taken over the daytime world this year. Not just with his repeated visits to General Hospital as Franco, but his egotistical appearances on soap covers, every blog on earth and every TV magazine show. He’d give an interview to my left (newly healed) broken left elbow! It’s not so much Franco’s sheer audacity as a publicity whore I detest as his story on GH. Honey, Marlena lives in Manhattan, and I don’t need I need a lesson in what “performance art” is. All art is supposed to make you think, and Franco’s mission on GH was supposed to make you think about Jason, and that he doesn’t realize how evil his life has become. Bonjour, everyone. This November will mark 20th anniversary of my becoming Marlena De Lacroix, soap critic. Marlena’s mission has always been to write the truth as I see it, no matter how impolitic. For years, we’ve watched and believed plots that would be unlikely or even ridiculous if they actually happened. But the secret of great soap opera is that the best and brightest writers knew how to craft and pace storylines so that they were EMOTIONALLY believable. Not any more. Not now! James Franco to General Hospital? Marlena’s Top 10! James Franco to guest star for two months on General Hospital has to be the biggest bombshell news in the decades I’ve watched and written about soaps. I just heard, and it’s fabulous! As much as I love soaps, my mind jumped to wise guy remarks, a la David Letterman’s nightly Top 10. And I have no shame: here’s my instant Top 10 list. Marlena challenges you to add your remarks after mine, all in good fun, of course. 10. I saw James Franco in his breakout role, James Dean in a TV movie bio of Dean, the first and greatest “younger” star ever. 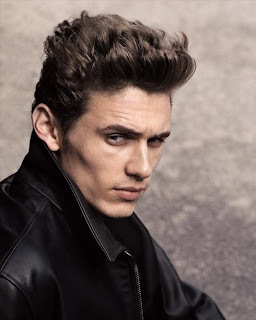 James Dean was a genius; young Franco displayed genius playing him. Have you ever heard the word genius being applied to anyone (yes, even the bravura Anthony Geary) on GH? 9. This casting dispels the Big Lie told by the soap magazines for the 35 years I’ve been reading them, namely that every soap actor is great. Can you imagine Deke Cheatwood in a scene with Franco?